I’m all about preparing and planning meals to assure you are getting the most nutritional bang, however sometimes convenience foods are necessary. 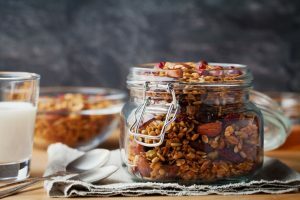 In our world of grab-n-go, life can get busy and having some snack and meal ideas on hand can be exactly what you need to make it through a busy day or week (or quite frankly sometimes couple of weeks). Smoothie. This might not be something you can grab from the pantry, but when it comes to a quick meal, a smoothie can be about as quick as it gets. 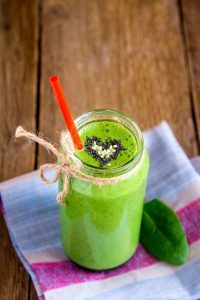 Yet there are a few rules when it comes to making smoothies – check those out here and here. Boiled eggs. Again, these take a moment to prepare, however it’s a staple that you can always have in the refrigerator. The can be great when eaten alone (my favorite way is with a drizzle of sriracha sauce and sprinkle of salt on top), as a side for a touch of protein and healthy fat, or mixed all together with a drizzle of olive oil, salt, and pepper as an egg salad. Bottom line is that boiled eggs can be made in bulk batches and used multiple ways. Trail mix or mixed nuts. The best thing about these is they can be found everywhere – even in convenience stores. You do have to be a little selective – while the nuts and seeds are good it’s best to choose the ones without candied chocolate in them. Or if you want to make it in batches, this is one of my favorite recipes. Guacamole or avocado with plantain chips. This is a favorite of mine when I want some crunch. The avocado/guac is a good source of healthy fat. You can also buy these in convenient portion controlled containers. The plantain chips – they feel so naughty but are actually a decent crunch (in reasonable amounts). Epic Bars or Tanka Bars. These are protein bars made of meat and paired with a piece of fruit can be a great portable snack. I usually stock up on these when I’m headed on a road trip because they can be just what you need to keep you out of a fast food line. Hummus with bell pepper slices. Hummus is one of my favorites that is packed with fiber. It’s also sold in individual, convenient prepackaged containers. Add some colored bell peppers and it’s a perfect duo. Many grocery stores will sell sliced colored bell peppers that make this a quick and easy grab. Otherwise spending a few minutes to slice a few baby bells to have on hand is quite simple. Tuna lettuce wraps. A quick tuna fish salad wrapped up in a romaine lettuce leaf is crispy and a great summer treat. Nut butter on an apple. 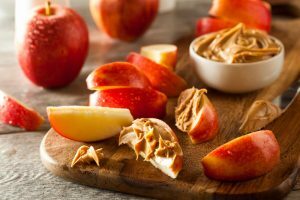 My favorite nut butter is sunflower seed butter, AKA sun butter, and it is perfect with an apple. Some brands make nut butters in individual squeezable pouches that make it easy to pack up and have with you any time. Canned smoked oysters (my favorite!) or sardines. I have to admit that I absolutely love smoked canned oysters! The Crown Pride brand is my go-to always have a can of these in my pantry. On mornings when I know the day will be hectic I grab one of these cans. I love them so much I will eat them straight from the can, usually paired with a piece of fruit – that just makes it feel better rounded. I said I had 10 convenience foods, but I really want to hear from you. What would you add to this list of convenient, grab-n-go foods that won’t wreck your blood sugar? Hummus and peppers are a classic combo, carrots go well also. There are many different types of hummus that can be found in stores these days to keep it interesting!!! Sea Snax! Seaweed snacks and kale chips make me feel like i am eating chips. I have hypo thyroid, and don’t understand if i should eat more iodine, as in sea snax, or avoid them.